Bran Castle, the fortress is situated on the border between Transylvania and Wallachia and is commonly known as "Dracula's Castle". Map view is showing the Southeastern European country, bordering the Black Sea in east. Countries with international borders to Romania are Bulgaria, Hungary, Moldova, Serbia, and Ukraine, it also shares a maritime border with Turkey. 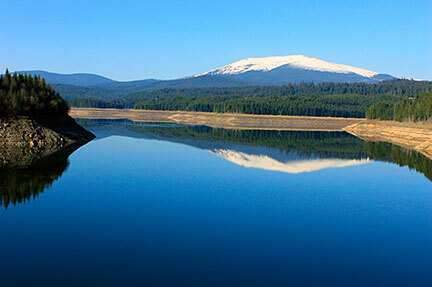 Pătru's peak (2130 m) in Alba County, seen from the dam of lake Oaşa. Romania occupies an area of 238,391 km², compared it is somewhat smaller than United Kingdom (242,900 km²), or slightly smaller than the U.S. state of Oregon. Romania has a population of 20 million people (2014), capital and largest city is Bucharest (Bucuresti), with a population of 2 million people. Primary port city is Constanta. Spoken language is Romanian (official). Romania's landscapes are partly mountainous and hilly and it has large lowland terrains. Its center is dominated by the Carpathian Mountains, highest point with 2,544 m is Moldoveanu Peak in Argeș County. Romania is home to the largest area of virgin forests in Europe. The map shows main cities and towns, expressways, roads, railroads and airports. To view just the map, click on the "Map" button. Google Map: Searchable map/satellite view of Romania.